This morning, the long-awaited first trailer for Quentin Tarantino’s The Hateful Eight — a project once temporarily imperiled by the despondent director’s angry reaction to an online script leak — finally arrived. Eight strangers are trapped together in a cabin, and one of them isn’t who he or she seems. Snow. Guns. Paranoia. Betrayal. Samuel L. Jackson. Kurt Russell’s magnificent facial hair. Lightning round — go! Dave Schilling: I have studiously avoided spoilers for this film, which is harder than it sounds considering the script has been floating around the Internet for over a year. So where some viewers of this trailer might say, “Oh, there goes Mr. Mustache McGee, my favorite character!” I shrug my shoulders. I was waiting to be bowled over by this, but I wasn’t. The widescreen vistas look great, the dialogue is typically snappy, but it all feels a bit too familiar. Am I nuts? Should I stop typing now? Dan Fierman: Quentin Tarantino. Bob Richardson shooting. Ennio Morricone with his first Western score in 40 years. Mustaches that would make Colin Farrell hurl his bolo in shame. There is absolutely nothing not to like here — and I say this as a man who has had his fill of Westerns (and Tarantino Westerns in particular). QT has said that he’s based this movie on the shows of his childhood, by the holy books of Bonanza, The Virginian, and The High Chaparral; that the form of (potentially) bad men all stuck hostage together by circumstance wouldn’t work today, but works in that context. But watching this trailer (on repeat, naturally), one is struck by how untrue that statement is — and how much this movie looks like his first. Bad men. One real location. A lot of guns and (one presumes) only one victor. We’ve seen this playbook before. Roth and Madsen, especially, should feel right at home. Sign me up in 70 mm. Jason Concepcion: For me, a large portion of the fun of Tarantino movies is trying to figure out what other movies he’s referencing. What equals snow plus Westerns? Famed mumblecore-fest McCabe & Mrs. Miller? Probably. Day of the Outlaw? Likely. Maybe even Warlock? OK, there’s no snow in that one; I am admittedly not the best at this game. Kurt Russell, stuck in a blizzard with eight strangers, saying stuff like “One of them fellas is not what he says he is”? I’m pretty sure I recognize that one. Count me in. Dave Schilling: I am definitely in the “Will see opening day” camp with Dan, but perhaps I’m more than a touch spoiled by the genre explorations that typified post–Kill Bill Tarantino. We’ve gotten his Shaw Brothers martial arts film, his war movie, his exploitation horror picture, and well, his Western (even if it conspicuously took place in the antebellum South). Does QT really have more to say about the venerable oater? More importantly, when will we get Quentin’s sci-fi space epic? Mark Lisanti: I’m glad that Dave backed off a little from that shrug of an opening salvo, sparing me from the uncharitable impulse of requesting that he throw his laptop out the nearest window and wander the streets of Hollywood in sackcloth and ashes, begging Tarantino for forgiveness. But then again, my first reaction to this trailer — which is really my first reaction to all Tarantino trailers, as infrequently and unexpectedly as they arrive — is to just stare at it in gape-mouthed awe for a while, like an easily manipulated child who padded down the stairs in footie pajamas in the middle of August to discover a Christmas tree in the middle of the living room. Once I get over the initial shock of the surprise, then I can get down to the business of opening the present. Which, as it turns out, is a giant box full of decapitated heads with complicated mustaches. The packing peanuts kind of remind me of snow. Blood-soaked snow, but kind of festive nonetheless. Thanks, Quentin Claus — it’s exactly what I asked for. I think I’m going to need to watch this eight or nine more times right now. Be right back. Gotta go shave my beard into a very poor approximation of whatever Kurt’s up to here. Chris Ryan: I hate that Tarantino trailers announce how many films he’s made. If he sticks to his stated 10-movies-and-out plan, then seeing the “eighth film by Quentin Tarantino” title card is kind of bittersweet. I think Jennifer Jason Leigh is going to be the best thing in this, by the way. Alex Pappademas: Not to be that guy, but [pushes metaphorical smartypants cineaste glasses up bridge of nose in classic That Guy About To Totally “Be That Guy” fashion] I saw an early version of this script performed live, at a Tarantino-directed reading in Los Angeles last spring. So assuming QT hasn’t radically revised the story since then, I know a thing or two about what this teaser isn’t showing us — notably (1) the seething post–Civil War racial animus that drives the plot once all the characters come in from the cold, and (2) where the bulk of the action actually takes place. At least as written, Hateful Eight is Tarantino in bottle-episode pressure-cooker mode, as in Reservoir Dogs, the Candieland banquet in Django Unchained, and the tavern scene from Inglourious Basterds, in which the entire Second World War acts as setup for a drinking game and some really, really tense conversation. The interesting thing about Tarantino’s period-piece period is that the movies are less “about” violence than ever before — they’re about talk, and the way talk can both hold off violence and render it inevitable. 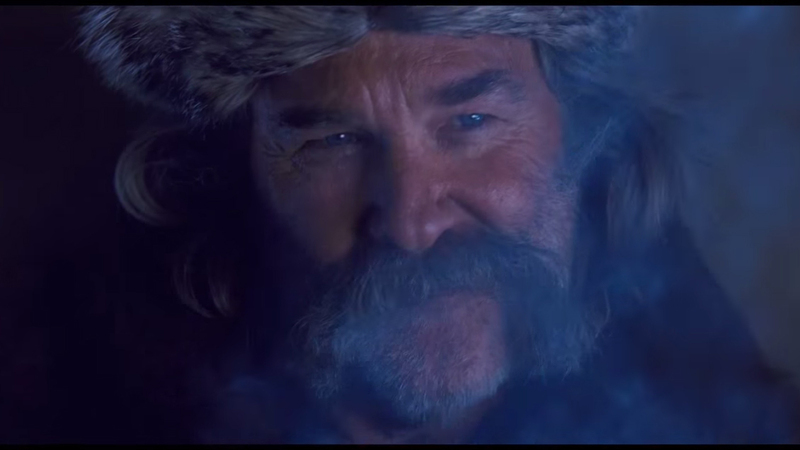 With Hateful Eight, it looks like he’s embraced the visual vocabulary of the old-school screen epic like never before, but what he’s really interested in is the way history’s vast and bloody sweep can come down to an exchange of harsh words between a few men in a small room. To Dave’s point: I would also love to see Tarantino try his hand at a galaxy-spanning sci-fi extravaganza someday — but only if it takes place in an escape pod.